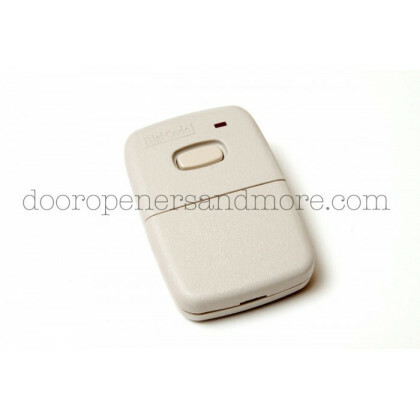 This Digi Code 5010 / DC5010 is a 300 MHz garage door or gate opener remote control and is directly compatible with all Multi Code or Digi Code 300 MHz radio receivers and remote controls. Programming is a snap just match the dip switches on your existing remote or receiver. Multi Code: 1089, 3089, 3089-11, 4120, 4120-01, 4140, 4140-01, 3060, 3060-01, 3070-01, 3083, 3083-01, and the 4200 or 4200-01 wireless keypad. -Multicode compatible 1-channel remote control transmitter. -Digital format with 10 dip switches, 1,024 possible code combinations. -Designed to be fully compatible with all Digi Code 300 mhz receivers as well as existing Multicode receivers, simply set the dip switches to match your receiver. -Dimensions are 3 3/4"x2 1/2"x7/8"